I don't normally like Georgette Heyer's mysteries, but I have to say I thoroughly enjoyed this one - all because of Randall. Yes, Randall, my latest crush in bookdom. The heir to the Matthews, the 'amiable snake' has a silky smooth, insinuatingly clever and mocking style that gets under the skin of his relatives; and yet you can't help but find him attractive. When Gregory Matthews, the head of the family is found poisoned, Randall, the most likely suspect has an unbreakable alibi. The rest of the family loathe him and would give anything to foist the murder onto him. With this odd assortment of relatives, all of whom have grievances against the victim, Superintendent Hannasyde finds his work cut out for him. Poisoning is not an easy crime to decipher and when he thinks he is getting nowhere, help comes from unexpected quarters. I was slightly worried that this mystery would end like Penhallow, one of her later novels, with the crime unsolved by the detective, but Randall didn't disappoint! He solved the case and laid it out to the Superintendent without a loophole. More than the murder, I was interested in the intricate relationships, the atmosphere and the tension between the various members of the family. The unique touch given by Randall's smooth and easy sarcasm was hugely entertaining (his is a type that recurs in many Georgette Heyer novels. I almost wish I could meet a real life example!). 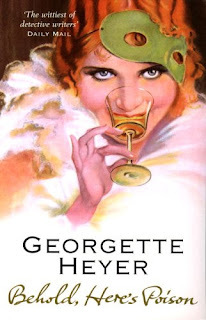 While reading, I compared Heyer to Christie and I realized that Georgette Heyer's mysteries are focused mainly not on the murder, but the character relationships. Agatha Christie was detailed on the workings and planning of the murder, the character of the murderer etc; although she did include good character portrayals, they were secondary to the plot and the main detective. In Georgette Heyer, we are much more intimate with the cast and get to know them well, and the murder is a sort of setting to display their personalities. The murder is discussed by all the characters, but innumerable clues aren't laid out for us to follow like in a detective hunt! So, if you're looking for a detective story, Agatha Christie would be more to your liking, but for an all round nice novel, I'd choose Georgette Heyer.